Snowboarding is about to get a little weirder on Nintendo Switch. Byteparrot has announced Slopecrashers for Nintendo Switch. The game features animals on snowboards, and can host up to four players in local multiplayer races. For now, the developer has mentioned on Reddit that they are aiming for a 2019 release window. 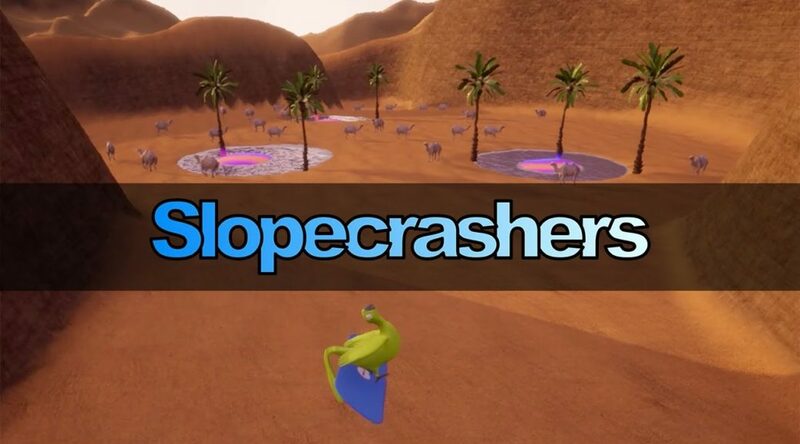 It is a pleasure to announce the first platform slopecrashers will release on. We here at byteparrot think the Nintendo Switch is an incredible platform for couch-coop multiplayer due to the fact that the console even ships with two controllers. We are working hard to optimize the game for 4-player splitscreen play and we will share more details about it soon. The main gameplay of course is the steering of the snowboarder down the slopes of the different environments and, unlike in real life, in Slopecrashers this task is rather simple. If the character is facing downwards, he will get faster, and by using the left stick you can carve and rotate your board against the slope to break. To get off the ground or accelerate on an even floor simply press the jump button. To do flips in the air, you just have to hold the jump button and tilt the left stick in a direction to preload a rotation. As soon as you let go of the jump button, the character will take off and rotate in the air. You can also do different tricks with the right stick, or with another face button if you play using single joy-con steering. If you miscalculate a jump or if you can already see that you won’t land on the planned spot, you don’t necessarily crash. Here the animals are prepared for situations like this and you can always deploy your glider in mid air and adjust and break your fall as long as the character has energy. To catch up on your opponents, there are plenty of items to use. To get an item, you just have to pick up an item box on the track and you will get an item based on your rank which should help you catch up and gain some positions or defend your position. Another important factor to overtake opponents is to take a look around the course and look for shortcuts. Sometimes shortcuts can easily be taken by turning at the right time, but sometimes you have to make use of the glider or of boost items correctly.